Opinions vary on this one: take a tour of one of Britain’s historic ships and you’ll be told that 18th-century sailors ate from Royal Navy standard issue square wooden plates – true, and the link sounds reasonable. But it seems the phrase ‘a square meal’ didn’t appear in print until the mid-19th century and originated in America, from the proper, honest, straightforward meaning of square. So the expression means a good, wholesome meal served on any shape of plate you like. The staple of every period home has fairly humble origins. Derived from the old word for clothes, the shelf above a fireplace was originally used for drying wet ‘mantles’. Here’s another much-used expression where the storytellers are at odds with its documented usage. One explanation involves the 16th- and 17th-century beds, where the rope supports were tightened to provide a good night’s sleep. Some dispute this, though, as it seems the phrase wasn’t recorded until the mid-19th century, so the more likely derivation is from the meaning of tight, as in firmly, soundly or fast – eyes shut tight, door closed tight. A commonly used phrase, meaning to reveal a secret. The expression is thought to have originated from the dishonest marketplace practice of substituting a cat for a piglet. Anyone who let the cat out of the bag would expose the trick. This opulent 18th-century equivalent of a man shed is where you would find the pampered lady of the house when things weren’t going her way. From the French word bouder – meaning ‘to sulk’. 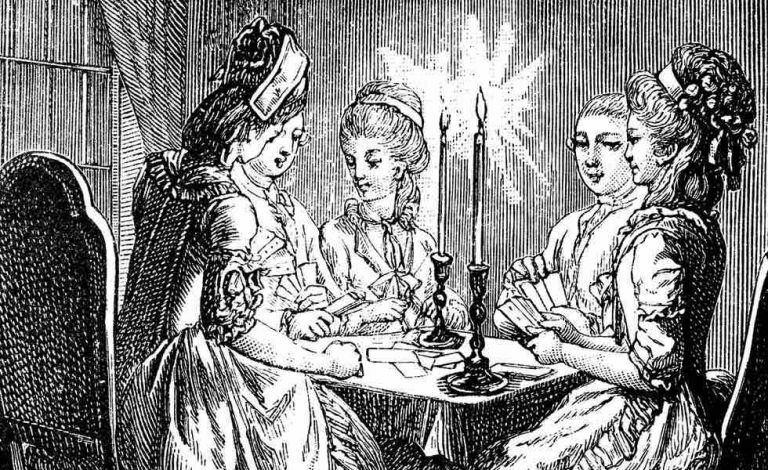 This gauge of an activity’s merit, or lack of, is all about its 17th-century social context, when candles were an expensive commodity. Medieval bakers weren’t innumerate, but they added an extra loaf or two to their dozen to ensure that they weren’t selling under the regulated weight. If they were selling a single loaf at a time, they’d add an extra piece of bread, known as the in-bread. How many times have we used this caution, without a thought for its reference to the ancient art of falconry? The practice of training and using birds of prey to catch wild quarry both for sport and to provide food for the table is thought to date back to the 1st Century BC, but became particularly popular among the noble classes in medieval Europe. Birds of prey were expensive creatures, so a falcon (in or on your hand) was seen as a valuable thing, worth more than its prey (cowering in the bush). This relates to the workplace practice where apprentices had to hold a candle for their more experienced superiors, to give them light to work by. If you weren’t judged good enough to hold a candle for other workers, then you were very lowly indeed. The phrase is usually used in this negative sense, for example, ‘I’m not a bad artist, but I can’t hold a candle to Picasso’. A board was a table, and something that was above board, was open, honest and clear for all to see. So this phrase is thought to have found its origins in card playing. If the players’ hands remain above the table (board), they are playing honestly and by the rules. A far more dangerous secret than the cat in the bag (see no 4 above), the skeleton in question was a shameful secret covered up by a person or family. The closet in question was a cupboard or wardrobe, not a toilet or water closet. Finally, from Brewer’s Dictionary of Phrase & Fable, an obscure little gem of an expression that means ‘a man who steals the lead off of a house or church’. Bluey was a slang term for lead, from its colour. To pigeon was to cheat someone of something. So blue-pigeon is to steal someone’s lead, and a flyer is someone who flies off with said lead. Something that could be adapted for modern-day pigeons stealing copper from our broadband cables.